This Vanilla Hemp Milk recipe uses protein-rich hemp seeds which are also a nice source of omega-3 fatty acids. This dairy-free milk alternative works great on cereals, coffee creamer, or base of a chia pudding. This homemade Vanilla Hemp Milk is my favorite non-dairy milk of the moment (see my almond milk and macadamia nut milk-making guides from the past). 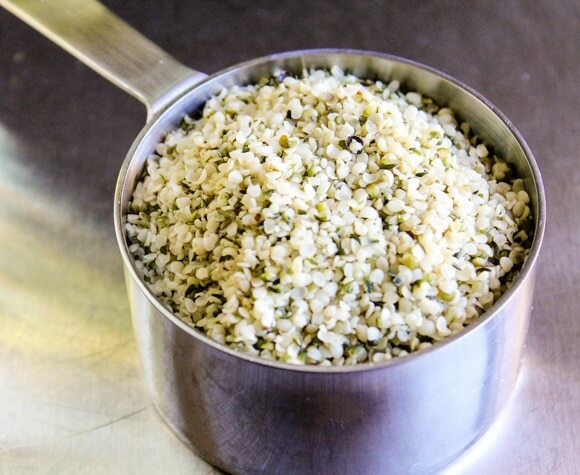 This recipe is pretty awesome because it requires no straining through a nut milk bag, which ensures that you get the full nutrition from the hemp seed, including fiber and omega-3 fatty acids. Plus, water and vanilla. 30 seconds later and you get a frothy, beautiful Vanilla Hemp Milk. That’s it! I mean, honestly, how easy is that? Hemp milk keeps easily for up to 5 days in a tightly sealed container stored in the refrigerator, and it doesn’t separate too badly…just give it a quick shake if need be. 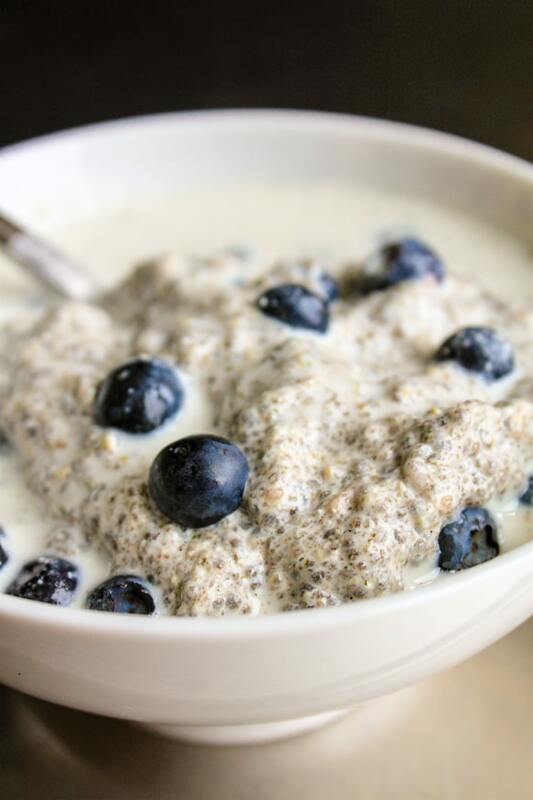 I prefer to use hemp milk for raw (non-cooked) recipes to preserve the healthy fats, a chia pudding with blueberries is one example. To make the pudding, just combine 1/2 cup of the hemp milk with 3 tablespoons of chia seeds and top with fresh blueberries. 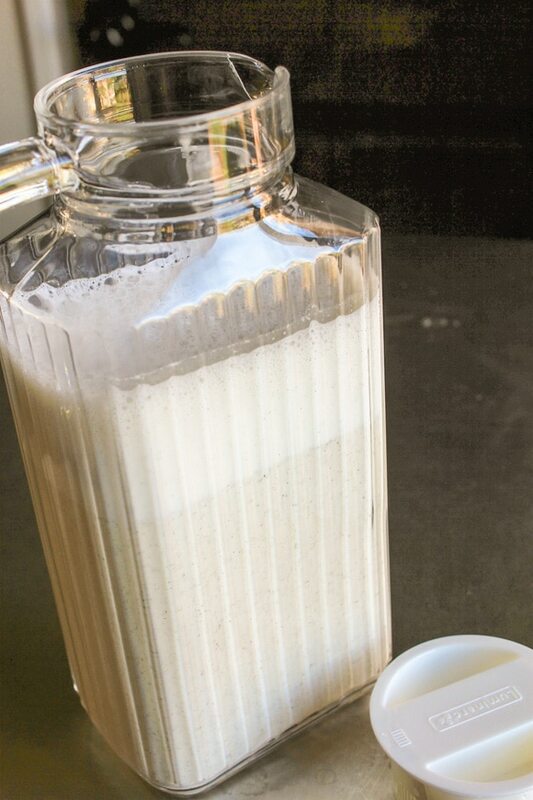 Vanilla hemp milk is a delicious dairy-free milk that can be made in minutes. 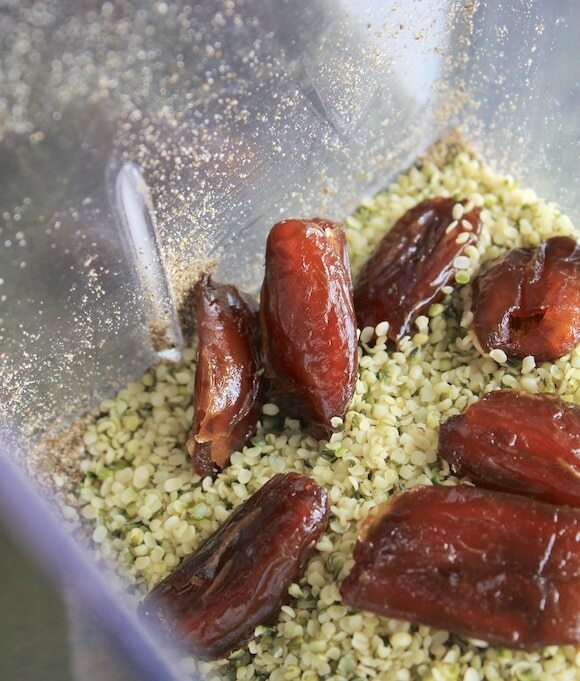 Combine the hemp seeds, filtered water, and pitted dates in the pitcher of a high-speed blender. Use a paring knife to cut off the ends of the vanilla bean. Then, hold the bean firmly against a cutting board and slice the bean lengthwise. Open the bean and scrape out the seeds, adding them to the pitcher. Discard the empty vanilla bean pod. Process the contents in the pitcher on high for about 30 seconds. You do not need to strain the milk, and it will stay fresh for up to 5 day in the refrigerator. And hemp is my favourite to make, as you say – no straining! I made a unsweetened and unflavored hemp milk and am using it in my smoothies. So amazing! I will have to try a sweetened and flavored version now! I will definitely be trying this! I’m always interested in dairy alternatives. I also like your nice simple chia pudding recipe, as I’ve been planning to try to incorporate more chia into my menus. This is perfect timing for me! Love how simple this is! 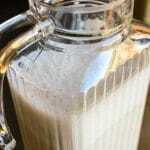 Making my own dairy-free milks is definitely a money-saver and is better for me, too! Hemp milk is one of my favorite dairy free milks! Love your sweet vanilla variation. So easy to make! Love having hemp milk in my fridge for my coffee, tea or oats. I have been wanting to try making my own hemp milk…the store bought has WAY too much sugar!! thanks you! I am dairy free so this recipe is right up my alley! I would never have fathomed to make a recipe such as this but you make it sounds so easy! i’m going to have to give it a go! This sounds so good. I need to get a high speed blender! I love my immersion blender, but it just doesn’t cut it for lots of things. I really want to start making my own milks, too. Can’t wait to try your hemp milk! Totally delicious. Those dates. And how the porridge looks. LOVE this, so yummy! I’m sold!! I had no idea it was that easy and I don’t turn down anything made with dates! Plus no straining?!? Yes please! 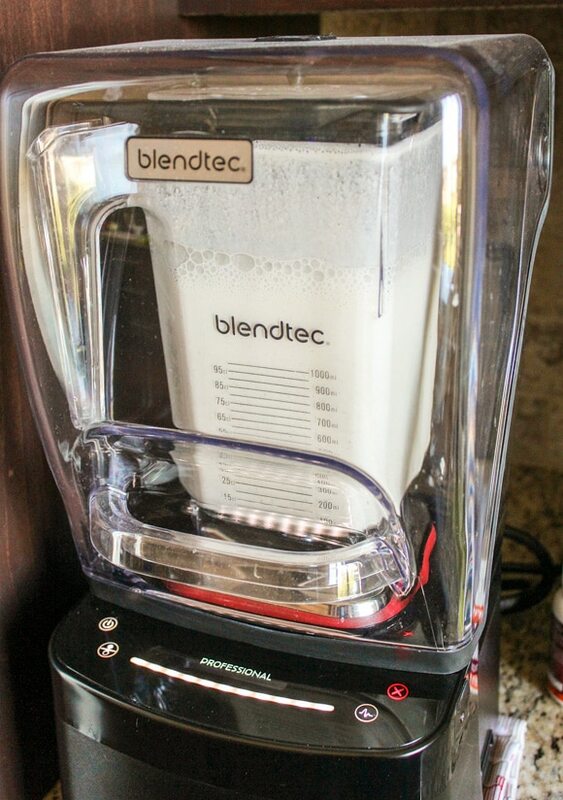 on that note, i need a new blender to make these yummy nut milks! The hemp milk sounds so good and nutritious. I think my husband would like this with his breakfast. He is a big almond milk fan too. Thanks for sharing a great recipe! This hemp milk looks so easy and delicious. I love the big bowl of oatmeal, it looks fabulous! I didn’t know it was so easy to make. WoW, I’ve always wanted to make hemp milk at home and this is so easy. I’m going to try this soon and loving the addition of vanilla. Homemade milks are so much better than store-bough! I usually just make coconut, but I want to try hemp now! I’ve never tried hemp milk but would love to. You do make it seem very simple and I like that it’s so nutritious. I’d like it with my oatmeal or cereal for breakfast. Will be pinning . Wow…looks creamy and awesome. I love the idea of this on a bowl of warm grains. Nice job! Oh my yum! I can’t wait to try your recipe! I have never made hemp milk! Yum! I’ve never tried hemp milk before but we are frequent almond milk users, I’m definitely interested in finding out the difference. I love using it to make chia pudding so your recipe would be great! 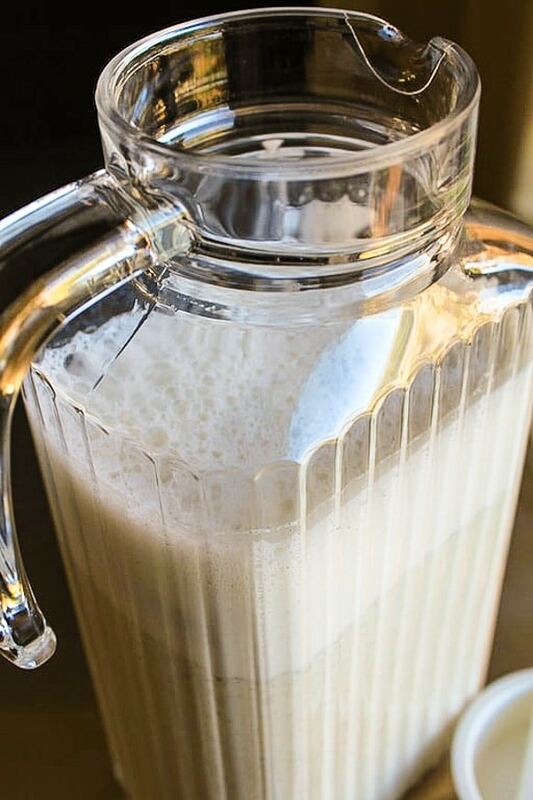 I’ve been wanting to make hemp milk and this recipe looks perfect. I love that it’s vanilla! I’ve never tried hemp milk, but this recipe looks super easy to make. And I’m a big fan of vanilla so this is a win for me! I’ve used hemp seeds before in baking, but never for hemp milk. Do you have to include the dates? Is it too bitter or bland without them? 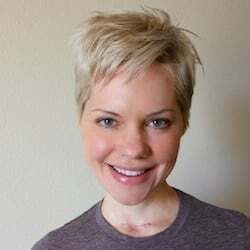 I tried hemp milk at a coffee shop when I visited a friend in Oregon. It was so good! I absolutely love hemp milk and so does my family. I have never made it and I cannot wait to make your recipe. It is super easy and full of natural great flavors! I am so excited to try this hemp milk recipe! I love that it doesn’t contain any thickeners like the store-bought versions! within 5 days. It came out great: frothy and creamy-looking. Thank you!